Cheddar Gorge and Caves offers a brilliant chance for everyone to explore a part of our world that has existed and developed over 300 million years ago. You can climb the steps up the side of the gorge to the top of the Lookout Tower for some breath-taking views and then continue along the 3-mile cliff top walk to take in the stunning views. For those that enjoy a slower pace, there’s the Gorge Open-top Bus Tour complete with a guide who will fill you in on all the fun and interesting facts about Britain’s most beautiful gorge. As well as the beautiful views and nature there are also two magical caves that need to be explored during your day out, filled with fascinating stories and containing Britain’s most impressive stalactite cavern, they are a definite must-see. Finish your fun day out with a visit to the Cheddar Man Museum of Prehistory where you can discover more about the Ice Ages and our ancestors, and kids can get involved with cave painting. All of these attractions are included in the Gorge and Caves Explorer Ticket and you can save money on tickets by using a Cheddar Gorge and Caves discount when you book. How do I use my Cheddar Gorge vouchers? 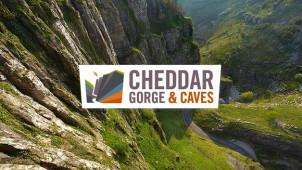 Choose the vouchercloud offer you want to use for your visit to Cheddar Gorge and Caves and click on 'View Deal' to get your voucher or discount code. For some deals you don't need a code or voucher and will be told to go straight to their website to book. Use your code when you book and pay online. Printable vouchers, for instance those you can use in the gift shop, should be shown when you make your purchase to claim the discount. You can save up to 15% by purchasing your tickets online in advance. However, you do need to book them the day before you travel, not on the morning of your visit. When are Cheddar Gorge and Caves open? Cheddar Gorge and Caves is open every day except Christmas Eve and Christmas Day. Attractions are open from 10am – 5pm with last entry at 4.30pm. The Cheddar Gorge Open-Top Bus Tour does not operate during the Winter Period, for detailed information please visit the Open-Top Bus Tour page. Are there car parking areas at Cheddar Gorge and Caves? There are over 550 spaces for cars at Cheddar Gorge and Caves. Cliff Street Pay & Display car park has 150 spaces and there are a further 400 spaces located in car parks at various points within the site itself costing from £3-5 depending on the time of year. For full details and directions to individual car parks please visit the website. Can we bring dogs to Cheddar Gorge and Caves? Dogs are welcome in the gorge, caves and museum as long as they are kept on their lead at all times. How long will I spend on each activity? A trip round the caves can take around 30-45 minutes depending on how busy the attractions are. The 3 mile Cliff-top Gorge Walk can talk around 1 ½ hours however this is dependent on walking abilities and personal preference to have breaks etc. Allow at least 30 minutes to get the most out of the Cheddar Man – Museum of Prehistory. Remember walking between locations can take up to 30 minutes depending on your speed. Cheddar Gorge and Caves is a great day out for families, nature lovers and outdoor adventurers. Paying a visit to this world-famous Area of Outstanding Natural Beauty is well within your budget when you book your entry online with a Cheddar Gorge voucher code. With spectacular views from dramatic 450ft cliffs to stunning stalactite caverns that the whole family can explore; there are lots of activities and chances to explore the beauty of Cheddar Gorge. Cheddar Gorge has a new cave experience called Dreamhunters: The Adventures of Early Man. This new and exciting multi-media experience takes place at Cox’s Cave and allows groups of up to 10 people the chance to walk in the footsteps of their ancestors. During the Dreamhunter experience you will be able to see the pioneering journey that resulted in mankind becoming the most successful species on the planet and you can discover how our forbearers’ mastered tools and fire in order to overcome dangerous predators. Why not plan to visit two amazing attractions this year and save up to 10% on both by purchasing a Cheddar Gorge/Longleat Safari Park Combo Ticket online. You and your family can have the ultimate outdoor adventure at Cheddar Gorge one day and explore the UK’s number one Safari Park the next at a snip of the usual price - just book with a Cheddar Gorge discount code online to save! When booking the combo ticket, you will need to select the date you wish to visit Longleat; however you are not required to provide a visit date for Cheddar Gorge.